Register by April 26 for Gaynor’s Spring Carnival on May 5 from 1-4 pm! 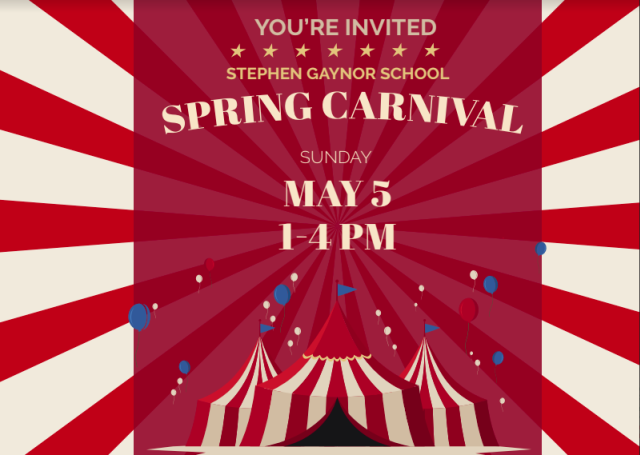 The school will be transformed into an innovative carnival with fun games and activities for the whole family! From Purple to Blue, there’s something for everyone. Activities Include: Bounce House Extravaganza, Entertaining Carnival Games, High-Tech Arcade Games, Virtual Reality Experiences, Custom Face Painting, One-of-a-Kind Raffle Items and more! Admission is $100 for a Gaynor Family Ticket (includes 4 tickets) and $15 for additional guest tickets.